HUNTINGTON, N.Y. - March 21, 2013 - PRLog -- Award-winning author Barbara Prignano will be signing books at The Book Revue in Huntington, New York on Saturday March 23rd. Prignano joins an illustrious list of authors holding events at The Book Revue, including President Bill Clinton, James Patterson, Clive Cussler, JK Rowling, and Kathie Lee Gifford to name just a few. The author’s children’s books feature animals and insects that have their own lessons to be learned. Anthony and the Magic Bumblebee is a 2011 International Book Awards Finalist and also received the 2011 Pinnacle Book Achievement Award. How Bunnies got Their Cottontails received Honorable Mention in the 2012 New York Book Festival/children's book category. In addition to writing, author Barbara Prignano is an attorney and small business owner on Long Island, New York. Her two young sons are a constant inspiration for her lighthearted stories. For more information on Barbara and her works, visit her website at sbpra.com/BarbaraPrignano and www.prignanobooks.com. Barbara Prignano writes a wonderfully imaginative children’s tale in How Bunnies Got their Cottontails. Little Joseph loves to play! If he could, Joseph would play all day, but Mom knows that little boys also need to do their chores. Joseph’s mom gives Joseph the important job of watering the outdoor plants. Joseph is unhappy about this. It takes up time to water all of Mom’s plants; time that Joseph thinks could be better spent playing! Joseph comes up with a very ingenious way to keep the plants watered, without wasting precious play time. A little bunny comes along and finds what Joseph has left next to the plants and it’s just what the bunny needs. How does Joseph attempt to keep his plants watered and why do bunnies need it? The author and illustrator are childhood friends that collaborated to share this adorable story with young children. Barbara Prignano has written a delightful book that children will find amusing and fun. Jennifer K. Okubo’s cheerful illustrations bring her story to life. How Bunnies Got Their Cottontails is a perfect bedtime book to have your little ones on their way to sweet and happy dreams! In this delightful children’s book, a little boy named Anthony discovers a bumblebee sprinkling magic dust. Just what is this magic dust? Anthony and the Magic Bumblebee provides a wonderful teaching opportunity to learn all about pollination. Anthony wants to help his friend Joseph grow flowers for his Grandma, so he asks the bumblebee for help. The bee is happy to help pollinate the pretty sunflowers that can then be delivered to Grandma. Anthony and the Magic Bumblebee is a 2011 International Book Awards Finalist and recipient of the 2011 Pinnacle Book Achievement Award. 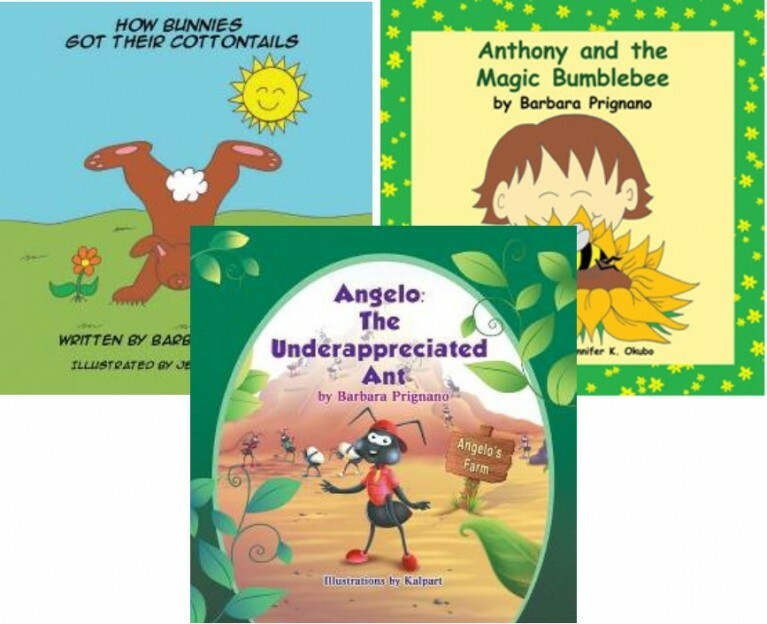 Angelo: The Underappreciated Antis a wonderful children’s book that shows even when the odds are against you, perseverance and determination can win the day. Take Angelo, for example. Angelo is the smallest ant in his family. He can’t work as fast as the other ants and is not as strong, but he is a determined little ant and is very proud of all his accomplishments. When the family farm is threatened by a big storm, Angelo is told that he isn’t needed. Determined to help anyway, he uses his knowledge and skills, setting out on his own to try to save the farm. Can one little ant make a difference? can be ordered through the publisher’s website: sbpra.com/BarbaraPrignano or at www.amazon.com or www.barnesandnoble.com. Contact your representative with the ISBN for purchase. Wholesale purchase for retailers, universities, libraries, and other organizations is also available through the publisher; please email bookorder@aeg-online-store.com.